We’d love to tell you that the whole of the descent from Cross of Greet to Slaidburn was a joyous corkscrew plunge through a beautiful valley gouged into the fern-covered hills of the Badlands, but we can’t….heh, heh, heh. Sat plumb in the way is our old friend Merrybent Hill. You know when you’re hammering down a long descent on tired legs and then there is a quite unnecessary up, and suddenly your thighs feel like two burnt logs sitting cold and cindery on the grate? Need we say more? This hill has two bends on the way up, but we wouldn’t necessarily characterise them as merry. Sweaty perhaps, but merry? Are you a glass half full or half empty kind of person? 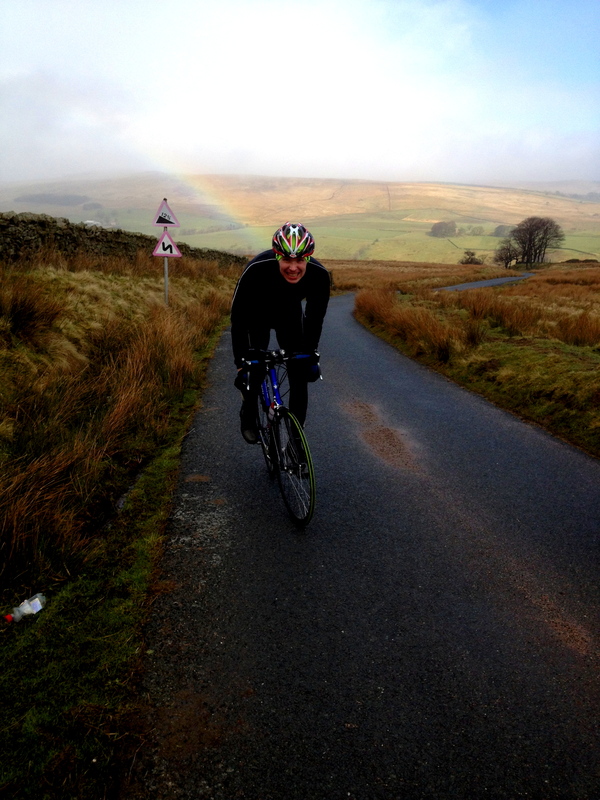 Posted on April 10, 2013, in Bowland Badass Climbs and tagged bowland, Bowland Badass, Bowland Forest, Bowland hills, Climbs, Cross of Greet, Cycling, Garmin, Garstang, Merrybent Hill, Route. Bookmark the permalink. Leave a comment.